If you would like to get a full printed list of the cases and documents included in your saved folders, please see the second column on the screen while viewing your folders. At the top of the column, look for the printer icon in the grey band. Clicking this icon, and selecting a list of results from the drop down generates a PDF with a list of all your results from the selected folder. You can now choose to either print this document or save it to your desktop as you please. Just select the document that you would like to print. You can then navigate to the grey bar at the top of the third column and click the printer icon. 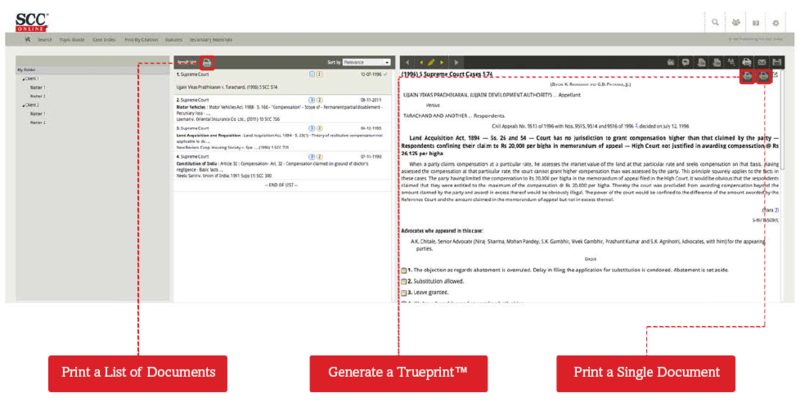 If a Trueprint™ of the document is available the icon will also appear and will enable you to generate a Trueprint™ of the saved document. Clicking the print icon, generates a PDF version of your selected document in a new tab. You can now choose to either print this document or save it to your desktop as you please.